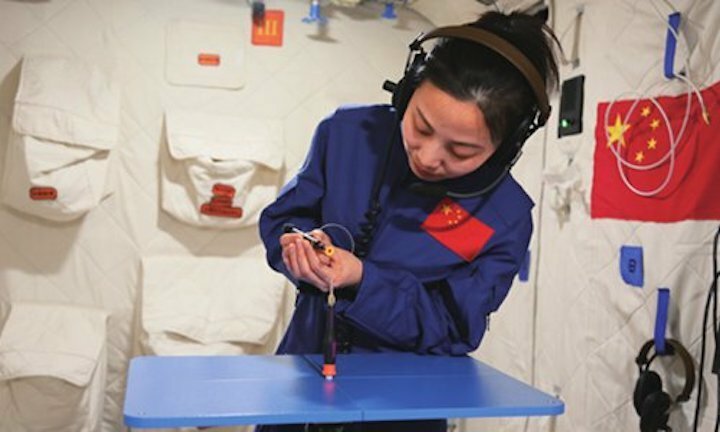 Chinese women are playing a more significant role in the country's aerospace programs, working as astronauts, helping develop aeromedicine and Mars exploration, according to an expert. Two women, Liu Yang and Wang Yaping, are members of the seventh team of Chinese astronauts. They were selected from a group of married female transport plane pilots, and are among China's fist 10 astronauts who have been in space. Both Liu and Wang worked in space as mission specialists and were shown to have excellent physical and psychological attributers, Pang Zhihao, national chief science communication expert of space exploration technology, told the Global Times on Thursday. Pang said female astronauts have unique advantages in both psychology and physiology. They are more emotionally stable and more capable of enduring loneliness. Pang also maintains that women have better work efficiency as they are more considerate and have better superior communication skills than men. Wang Yaping, who is also a deputy of the National People's Congress, said working on China's soon-to-be-launched space station requires special training to carry out extravehicular activities and learning how to use the station's robotic arms, Voice of Straits Broadcasting Station reported. Wang's mission in 2013 was onboard the Tiangong-1 space lab module with five other astronauts. She delivered China's first televised science lecture to an audience of more than 60 million schoolchildren and teachers in China. "I hope to give another lesson from China's space station," she said. Women have lower iron content and produce less waste than men, making them less likely to contract diseases such as thrombus, which makes them more adaptable to long-term space flight, Pang said. Pang noted that a mission to Mars would be a long journey and female astronauts are suitable for long-term space explorations. China has not announced concrete plans to send people to Mars. Training and selection standards for people wanting to become astronauts are basically the same for men and women, Pang said. Liu Yang, China's first female astronaut, who flew into space in June 2012 aboard Shenzhou 9, completed 15 aeromedicine experiments including collecting harmful gas inside the capsule. Wang's lecture, from China's space lab in June 2013, centered on experiments that can utilize zero gravity. The 40-minute-lecture ignited space dreams among millions of Chinese students, the Xinhua News Agency reported in March 2018. Wang and Liu continue to receive training for future space missions. Pang predicts that the duo will take the spotlight on China's first space station that will be completed around 2022. In the US, two NASA astronauts will conduct the first all-women spacewalk on March 29, according to a female flight controller who tweeted the announcement on March 1. The China Manned Space Engineering Office announced Monday that the core module of the country's space station, the payload on the Long March-5B carrier rocket will be sent to the launch site later this year, to make preparations for the space station missions, according to Xinhua.